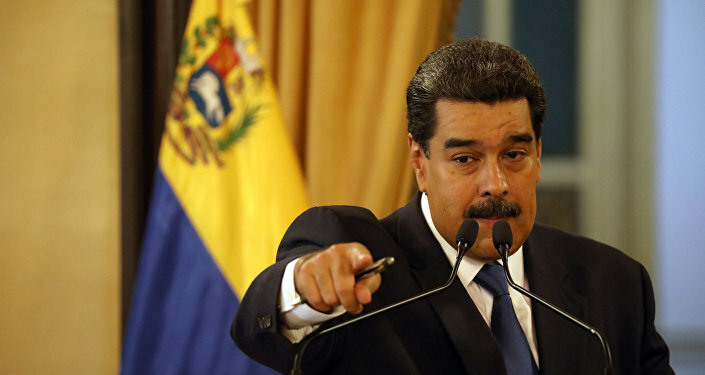 Venezuelan President Nicolas Maduro repeatedly blamed the ongoing political crisis in the country, which flared up after opposition leader Juan Guaido declared himself interim president, on the US, saying that it was reasoned by Trump's "infected hand" that is "hurting Venezuela". Venezuela's defence minister, Vladimir Padrino López, stated on Tuesday that if the opposition seeks to impose "a puppet government", it will have to pass over "our dead bodies." He emphasised that state armed forces will continue being stationed along Venezuela's border to thwart possible territorial threats. Commenting on the state of the country's senior military officers, the minister stressed that they remain "obedient and subordinate" to Venezuelan President Nicolas Maduro's government. The defence minister's comments come after on 16 February Venezuelan opposition leader Juan Guaido, who earlier declared himself the country's interim president, called on the Venezuelan Armed Forces, supporting President Nicolas Maduro, to change sides, giving the military seven days to do so, in the anticipation of humanitarian aid arrivals to the crisis-hit country. On 23 January, Guaido, who is the speaker of the opposition-controlled National Assembly, proclaimed himself interim president. He was almost immediately recognised by the United States and its allies. Russia, China, Mexico, among other nations, voiced support for constitutionally elected Maduro, who, in turn, accused Washington of orchestrating a coup in the country.